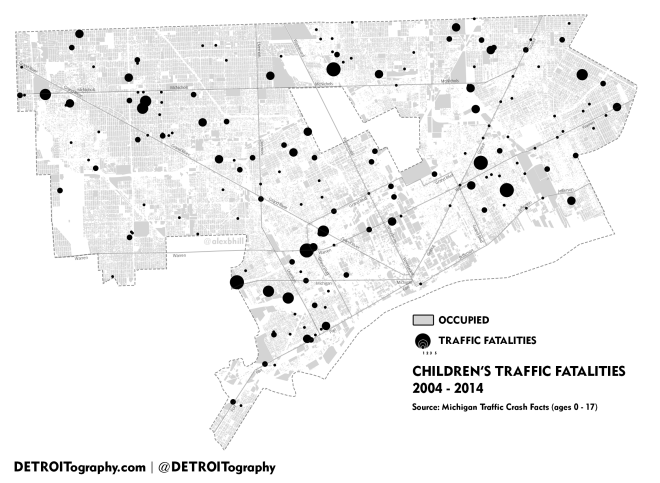 In rethinking the Detroit Geographic Expedition and Institute’s (DGEI) maps on “where black children get run over” and “citywide patterns of child traffic deaths and injuries” it became apparent to me that the pattern was partially due to the distribution of children in Detroit (map). For example Southwest has a higher density of children and also more traffic fatalities of children. However, there are some anomalies, such as the higher numbers on North-South streets in the Lower Eastside, on John R. North of Highland Park, and on Conner near the City Airport. Detroit is known its high infant mortality rate, high rates of gun violence, and poor education system that all contribute to a harsh environment for children. How do we better protect the children in our neighborhoods from cars?